Darryl Hansen :: Onalar wins Rockhampton Newmarket Handicap. Onalar wins Rockhampton Newmarket Handicap. 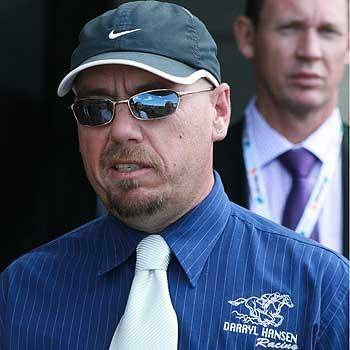 Mackay trainer Darryl Hansen rates himself a sound chance of completing the coveted Rockhampton Newmarket-Cup-double after his $11 chance Onalar scored an inspired win in the $75,000 XXXX Gold Newmarket (1300m) at Callaghan Park yesterday. Onalar, ridden by Brisbane's Ryan Wiggins, finished too strongly beating Craiglea Warrior (Garry Baker) who returned a $6.40 place dividend with Master Denis (Chris Whiteley) finishing third and returning a TAB dividend of $2.70. Heavily backed Brian Wakefield trained Cognisant was plunged from $11 to half that quote but never looked a winning chance and finished well back. Hansen, 38, with 22 horses in work in Mackay after relocating there from Rockhampton last year was "ecstatic" after the win which he rated up there with former stable star Luxford's Esk Cup win some years back. "With all the EI drama Onalar has only raced three times in the last month since being off the scene since last July. His recent fifth in the Tatt's Sprint in Rocky was very pleasing and he came into the Newmarket in magnificent order. I was confident of the win as his work in the last week indicated he had thrived," Hansen said. In the Rocky Cup tomorrow Hansen has dual winning prospects in Stage Shaker and Link Hogthrob. "I rate Stage Shaker a great chance in the Cup", Hansen said. At his previous four starts over the 1300 metres at Callaghan Park, Onalar had recorded two wins and a placing so it would appear that the distance was tailor-made for him. The $50,000 Mackay Newmarket (1250m) on July 10 and the $75,000 Cleveland Bay Sprint (1200m) at Townsville on July 24 are the impending goals for Onalar.